The fear of the unknown is pretty much what defines humanity. We walk slowly through dark corridors because we’re never sure what could be there. And, when we’re talking about the unknown, there is one big one that champions all others: Death. So few know what death is going to look like. We’ve got several examples of concept art throughout the world that gives us a pretty solid idea of the appearance that death might take… and it generally isn’t overly welcoming. Then again, perhaps we’re judging things a little too quickly. Death is a pretty wide concept and it can appear in a lot of different ways. We could have a gentle Death, a calm and sweet-speaking being of light who gently explains what has happened and leads us into a place of serenity. We might even have something absurd and funny, like a giant talking pie tin filled with mint whipped cream. Off to the afterlife in the best bath we’ve ever had! See? Death can take all sorts of forms and so many of them can be welcoming, relaxing, beautiful, or even funny! … Well, the thing is, when you let a kid decide what Death is going to look like all of those earlier terrifying assumptions are pretty much spot on. So, we can’t really help calm your nerves about any of that but we can give you the chance to get a bit more used to it. 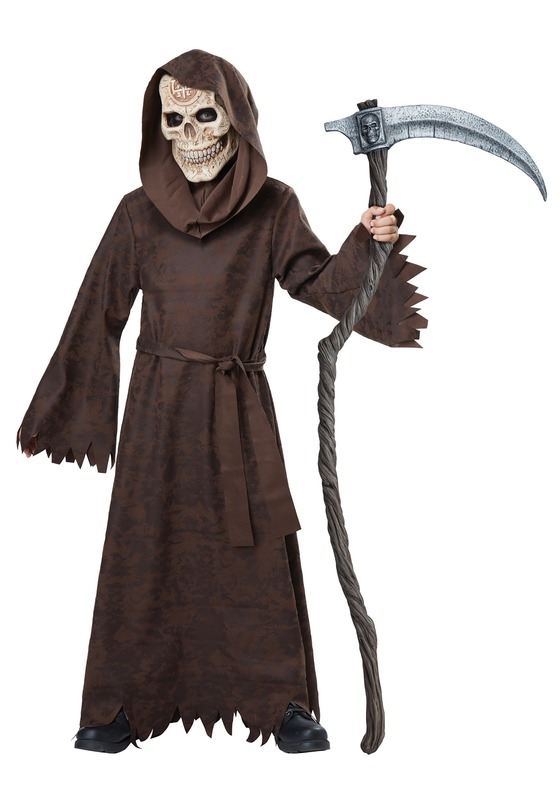 You can transform your kiddo (temporarily) into the agent of doom with this Child Ancient Reaper costume. This polyester brushed flannel robe is long and has ragged edges on both the cuff and hemline. It’s attached hood pulls up over the head and forms as a mysterious cowl. The vinyl half mask has molded details making the skeletal face aged and tinged with dark arcane powers. Join the costume with a scythe accessory if you’re ready for the real image or build up a resistance to the haunting spook and maybe join in your own Dark Death costume.